Steve Bowkett, Senior Lecturer in Architecture at LSBU, launched his new book this month, hosting an event which welcomed more than 200 architects and designers. Archidoodle City: An Architect’s Activity Book follows the success of Steve’s first interactive publication, Archidoodle, which has sold more than 70,000 copies and is published in 10 languages. The sequel, published by Laurence King Publishing, poses different architectural drawing challenges for the reader with an array of illustrations and briefs focusing on cities around the world. Linking to the book’s premise, the launch, which took place at the Domus showroom in Clerkenwell, saw eminent architects and designers get involved with interactive drawing activities. 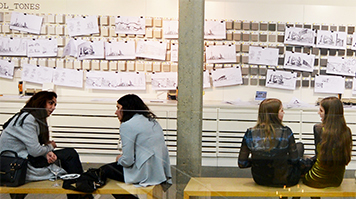 Throughout the evening, guests were invited to tackle a number of architectural ‘challenges’ which were posted around the space, and share their entries on social media, with the chance to win an illustration signed by Steve. As part of the launch, Steve and publisher Laurence King, spoke to audiences about publishing design and architecture books, discussing what makes a successful concept for a book and how to pitch ideas to publishers. “I hope the book will be useful for budding architects and designers of all ages, and that the interactive, fun element really sparks their creativity and imagination while learning about architecture and design,” Steve said. Find out more about LSBU's Architecture courses.